Ten years ago, Shawn Seipler learned that the barely used bars of hotel soap he left behind during business trips ended up in a landfill. Shawn realized that these products could be recycled to prevent hygiene-related illnesses around the globe, and from this transformational idea, the organization Clean the World was born. The global benefit corporation, headquartered in Orlando, collects and recycles soap products discarded by the hospitality industry and distributes these products to the impoverished, preventing millions of hygiene-related deaths each year. 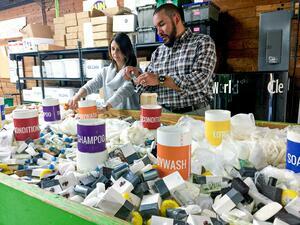 Clean the World is just one example of the social entrepreneurship movement taking place in the Orlando region. As consumers become increasingly concerned about their impact on society and the environment, social entrepreneurship has been on the rise to help solve significant issues on both a local and global scale. Social entrepreneurship is the development, funding, and implementation of solutions to social, cultural, or environmental issues. While for-profit companies typically measure performance by profit and revenues, enterprises founded by social entrepreneurs measure a positive return to society in addition to profit. In addition to Clean the World, several Orlando-based companies and organizations are working to tackle vital social and environmental issues. From for-profit corporations like Tupperware Brands Corporation and Arrow Sky Media to non-profit organizations such as LIFT Orlando and Rollins College, Orlando is at the forefront of the conversation about how social entrepreneurship can improve communities and solve global challenges. Global company Tupperware Brands Corporation, headquartered in Orlando, holds social responsibility at the core of its corporate mission. Tupperware has founded and currently operates numerous initiatives around the world to empower women and girls, including the Women Helping Others Foundation. Tupperware also analyzes the environmental footprint of its products and supply chain, committing to environmentally friendly products and a sustainable approach to product distribution. Learn more on Tupperware’s website here. 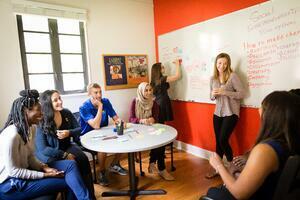 Another organization focused on social responsibility education is Rollins College. As one of only 36 colleges internationally recognized as an AshokaU Changemaker Campus, Rollins College is committed to providing its students with a personalized, hands-on education that inspires students to tackle big challenges facing our global community. To support this mission, the college has created a Social Innovation & Entrepreneurship Hub that helps foster global citizens and responsible leaders by educating, equipping, and empowering competent changemakers. LIFT Orlando is on a mission to break the cycle of poverty in one of Orlando’s most historically disadvantaged communities, Parramore, through holistic neighborhood revitalization. LIFT Orlando brings business leaders together to leverage their influence and interested with the specific goal of long-term economic vitality for the neighborhood. LIFT plans to use the success of Orlando’s Camping World Stadium, located in Parramore, to invest back into the surrounding community by building new, mixed-income residential housing and investing in cradle to career education initiatives and community wellness programs. LIFT is a one-of-a-kind organization built to solve a local Orlando community’s challenge; however, the model can be applied to communities across the globe to revitalize neighborhoods. On June 8, 2017, the Orlando Economic Partnership hosted a panel of social entrepreneurs, academic experts and industry partners for Insider Update, which was held at the Orlando City Stadium. The panelists included: Mary Dato-On, Ph.D., faculty director of the Rollins College Social Innovation and Entrepreneurship Hub; Victoria Lauren, managing director of Arrow Sky Media; Yolanda Londoño, vice president of global social responsibility at Tupperware; Eddy Moratin, executive director of LIFT Orlando, and Shawn Seipler, CEO of Clean the World. The panel was moderated by Mark Brewer, president and CEO of the Central Florida Foundation. For pictures from the event click here. Photo credits: Matt Meltzer, Thrillist Magazine; Rollins College, Social Innovation & Entreprenuership Hub.